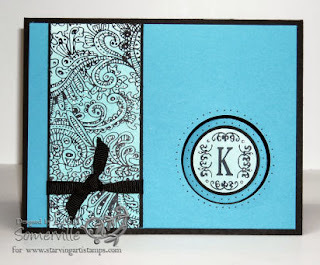 Just a quick and simple monogram card using the JustRite C-30 and my Ornate Tooled Leather background stamp from Starving Artistamps. To create the color on my background piece I used the Bandanna Technique from the August TJNL. Although it doesn't show in the scan, the white doodles are there! To create the suspension piece - I used several circle punches, smaller than the circle punched in my card stock and base piece. I dyed a piece of linen thread black to use as the suspension thread. Again white dots from my gel pen were added to the monogram.